Angels we have heard, a photo by The Bacher Family on Flickr. 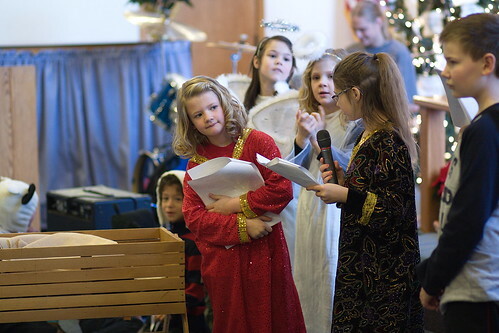 At the Bethany Lutheran Church Christmas program, everyone had a role, reading lines, singing, even playing the Little Drummer Boy. Here, one of our young actors reads her line, but my focus was on the child in the background watching with a look of concentration on her face. This isn't just a kid's play, folks -- this is epic and timeless material.